Sara Bareilles is a singer and songwriter. She was a judge for The Sing-Off and she has written beloved tunes like "Love Song," "Gravity," and "Brave." She is also the composer for the upcoming Broadway musical Waitress. In Sounds Like Me, Sara writes essays about her childhood, her triumphs and failures as a musician, and the professional and personal moments that have shaped her. I remember finding Sara Bareilles through the most cliché of ways - I heard "Love Song" on the radio and looked it up. But since then, I have been a big fan of her music and I am beyond thrilled that she is trying her hand at musical theatre for the first time. In these essays, she tells the stories behind her music - the depressed fan who inspired her to write "Satellite Call" and the friend who came out to her family, which made Sara think about what it really meant to be "Brave." Some of this book is straight memoir and some is told by letter, both by Sara herself and from a few other people. One of my favorite parts was reading about Sara's experiences in Italy. Her junior year of college was spent in Bologna and it was both amazing and terrible. This may be her first book, but I found her descriptions of being lonely and depressed wonderfully written. It is equally gratifying to hear how Sara, like so many of us, came out of the darkness through the beauty and power of music. Sounds Like Me is a deeply personal book. Each essay is titled with one of Sara's songs, and includes the lyrics in her handwriting and lots of pictures. I loved that the voice of the writer in this book is the same as the voice in her songs - strong, lovely, and precise. That's how you know this is her book, and not the work of a ghostwriter. 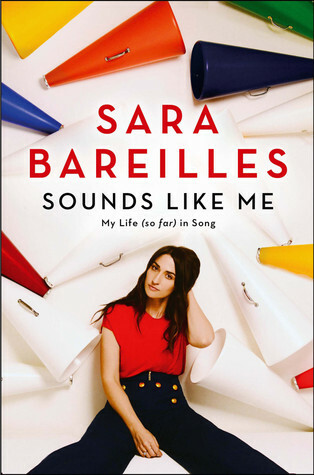 This is a must-read for anyone who has ever sung along to Sara's music in the car or in the darkness of a concert hall. While it is specifically about becoming confident as a musician, it is universally about growing into your own skin and having the courage to speak up for what you want and what you want to accomplish. This musician is completely new to me. Do you think one can enjoy her book, if one hasn't listened to her music? This sounds compelling, and I want to try. What do you think? Whaaaaaaaaaaaaaat? She wrote a book? Love Song still gets stuck in my head on the regular. I might have to check this out!